Our Looper coverage continues as we prep for Rian Johnson’s time-traveling assassination thriller, which opens in theaters on Friday, Sept. 28. Earlier this week, we sat down with Looper star Joseph Gordon-Levitt to discuss his character, a hit man tasked with eliminating targets from a distant future who hesitates on pulling the trigger when he realizes – in the blink of an eye – that his latest victim is the future version of himself (played by Bruce Willis). While JGL’s character goes on the hunt for his older self, his paths cross with a lovely but cautious farmer whose son has a bigger role in the larger Looper story. 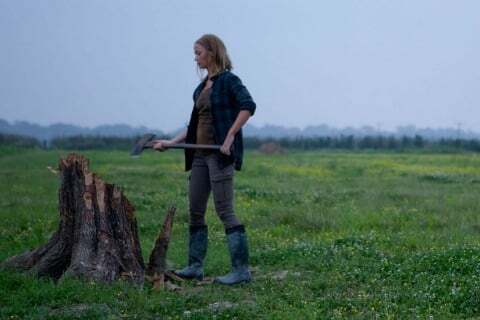 The farmer is played by Emily Blunt, who took time at the Toronto International Film Festival to speak with us about chopping wood, her nickname for her fans, and the enormous power of a mother’s love. Here’s Emily Blunt. Did you feel that The Adjustment Bureau wasn’t confusing enough for your die-hard fans, that you felt like you need to challenge them with a twisty time-bending thriller? And what, exactly, are your die-hard fans called? Blunt-ites? Blunt-heads? Oh, yes! Blunt-heads would be good. We absolutely need to go with that! Blunt-heads it is. Are you actively trying to challenge them? Oh, sure. I think I really just want to challenge myself, more than anything. People have been asking me if I’m gravitating to these sci-fi roles, but I don’t feel I necessarily am because they’ve been sort of sporadic as to when they come out. But I do like the idea of creating a backstop that is high concept for the characters to really have stuff to play with within that. When writing my review, I normally leave one or two paragraphs for plot synopsis. And that’s just not possible with this film. And your character, in particular, is difficult to explain without giving far too much away. Oh, that’s great. So what are you saying about Sarah that isn’t ruining everything? First off, thank you for not ruining everything. I play Sarah, who is a very, very tough cookie living an isolated existence on this remote farm in the middle of Kansas. I have a child. I’m a single mother. And she’s fiercely protective of her child. She never lets the outside world in, really. So Joe’s character shows up, and she’s very wary and threatened by his presence. But he’s actually there to protect them from Bruce Willis, who’s coming to get us, for reasons you are going to find out. Ah ,yes. The farm. I want to thank you for mentioning at the Comic-Con panel the fact that you had real wood flown to your home in California so that in the scenes where you are chopping wood, it didn’t look like you’d never done it before. Yes, that’s right. And it worked. I actually do not chop wood like a sissy. I practiced for a few weeks beforehand. You also wield a mean shotgun. Was that a physical tool that you played around with before the shoot? No, that they sort of handed to me on the day. I didn’t have much time to play around with the shotgun. But I’d been to a gun range before, and have fired those sorts of things before. Badly, I might add. Oh, I had a BB gun – my brother’s BB gun – when I was young. That was the only experience with guns that I’ve had. The driving force behind the narrative is pre-destiny and the butterfly effect, but that’s not what I took away from Looper. I was moved by Bruce’s story pertaining to true love, and a man who will change fate to be with the woman he adores. How much of that do you believe in? I do believe in that. I believe in change. I believe in redemption, and I think that’s what this movie is about, too … the redeeming qualities of love, and how profound that effect can be on people’s lives. And also, how much that can effect the cycle of things, even breaking the cycle of pain and destruction. I think that’s the theme that runs through Looper. Particularly a mother’s love. I really connected with that. Looper opens in theaters on Friday, Sept. 28. Is Emily Blunt Not Performing Mary Poppins At The Oscars?